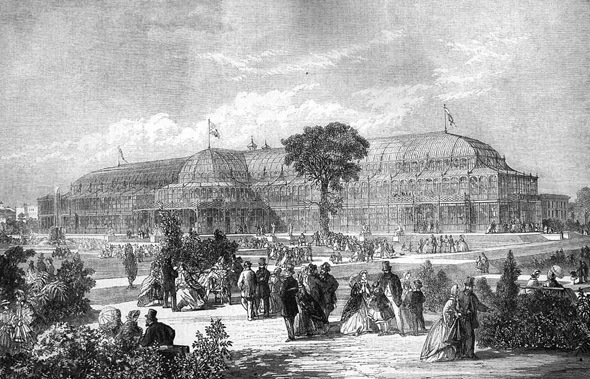 This was the second of three major International Exhibitions held in Dublin, constructed on what later became Iveagh Gardens – a previous exhibition was held in Merrion Square (1853 – Great Industrial Exhibition, Dublin), and a subsequent exhibition would be held in 1874. 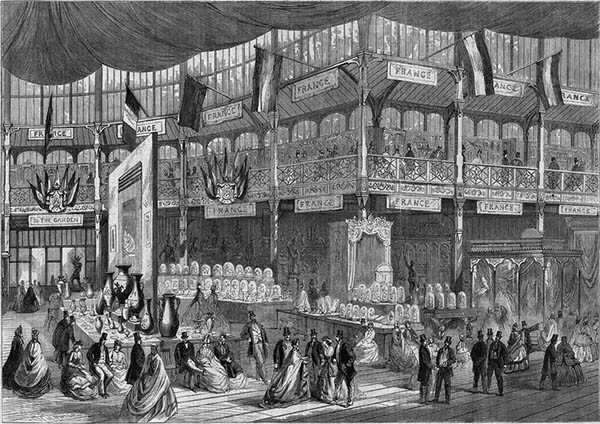 The interior of the Dublin Exhibition Palace shows the scale of the construction. After the exhibitions, the building were converted to examination halls for the Royal University of Ireland and then redeveloped in 1914. In the grounds some statuary and a decorative “rustic” grotto survive from the exhibition. 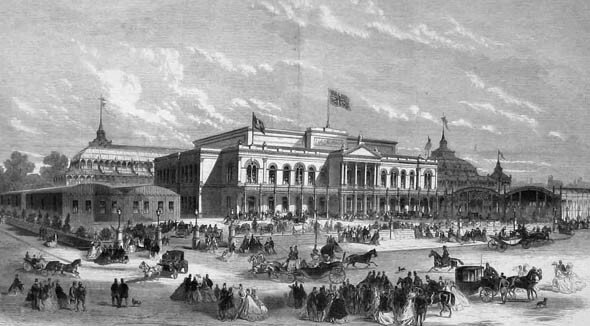 A contemporary publication reported: In June 1862 the Directors of the Dublin Winter Garden advertised in the public journals that they were prepared to receive designs and plans for the Exhibition Palace and Winter Garden Buildings proposed to be erected by the Company the expenditure not to exceed 35,000; 150 premium was offered for the best design and 75 for the second best. The time for sending in designs was fixed for the 1st August but this was subsequently extended to the 1st September 1862. In response to the public announcements a number of very beautiful designs were sent in, many of them reflecting the highest credit on their authors for originality of design accuracy of drawing and the care with which the various details had evidently been attended to. 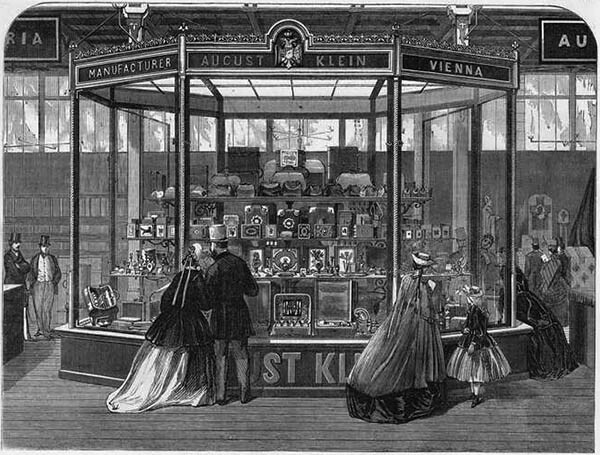 The competitive designs sent in were on view to the public at the Exhibition Hall College Street for about a month at a nominal charge of sixpence for admission. This committee at length sent in their report by which it was found that not one of the designs that afforded the required accommodation when the test of measurement was applied could be carried into execution with proper materials for anything like the sum named in the printed instructions. Under these circumstances there remained only one of two modes of proceeding to take, namely either to invite a fresh competition or to select the design that approached the nearest to the requirements of the Company for further consideration with a view of reducing the expenditure. To save time this latter course wag adopted and the plans of Mr A.G. Jones were selected. This gentleman received instructions to reconsider his design in conjunction with Mr F. Darley advising architect to the Company and make such alterations as were calculated to reduce all unnecessary expense. 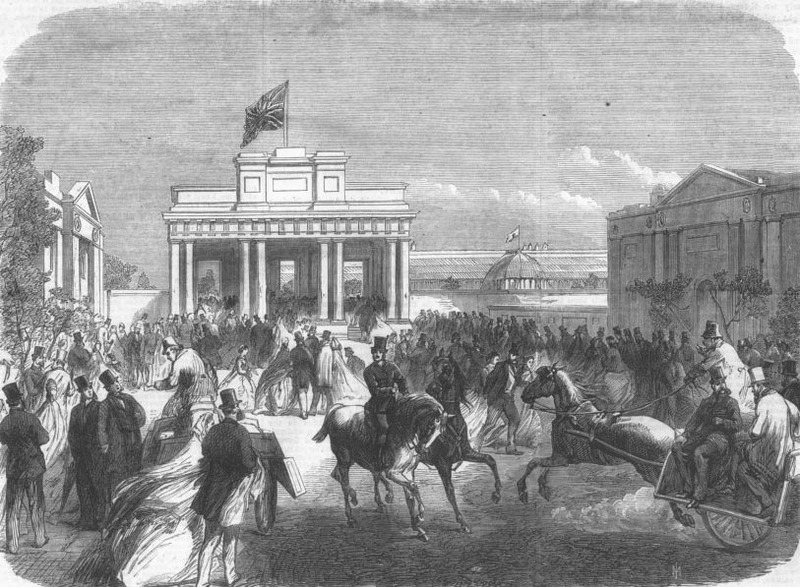 The Dublin Exhibition Palace and Winter Garden stands upon a site of about fifteen statute acres formerly known as the Cobourg Gardens bounded on the west side by Harcourt street on the north by Stephen’s green on the east by Earlsfort terrace and on the south by Hatch street. The several buildings cover an area of about five statute acres and consist of two distinct constructive features viz the Main Building which is a brick and stone structure with cement lining and the Winter Garden and Exhibition Building which is of iron and glass. In addition to these there is a permanent annex structure of stone with iron roof and glazed skylight at the north side of Winter Garden. The principal entrance to the building is from Earlsfort-terrace, through six pairs of gates which form a portion of the enclosure wall and chain railing; this runs the entire length of Earlsfort-terrace, for a distance of 250 feet along Hatch-street. Each of the gate entrances has four piers of granite, circular on plan, 3 feet 3 inches at base, 8 feet 6 inches high, and surmounted with a cast-iron lamp-post 7 feet high. The iron gates are 15 feet wide, and 6 feet high, hung to massive cast iron hands, which are leaded into the stone piers. The enclosure between the gates consists of a low wall of granite rustic masonry, three courses, each 13 inches high, with a moulded capping of granite 11 inches deep, having square blocks worked on to receive cast iron ornamental standards 3 feet 3 inches high, and 8 feet 6 inches from centre to centre, and having attached from the neck moulding of each the ornamental and cast iron chain railing. There are also intermediate piers of granite 55 feet apart, 2 feet 10 inches square at base, and 7 feet 7 inches high, to receive ornamental cast-iron lamp-posts. At each entrance are three pairs of gates, two of which are reserved for the entrance and exit of carriages only, leading on to a drive 510 feet long by 70 feet wide, the remaining gate being for the use of foot passengers, each roadway having a footpath connecting with colonnade, there being a covered way in front 379 feet long. The main building, which covers an area of 5,700 square yards, consists of three separate floors, the basement, ground, and gallery floor levels. The basement, which occupies the south portion of main building, covers an area of 1,500 square yards, and is 8 feet 6 inches lower than general ground level, having three means of communication, one external, from the area at south-west angle, and two internal, one at southcast angle of practice room, having a lift in connexion with it to serve up dinners, &c, and the other at exhibition end of south corridor. The main divisions of the basement plan consist of an area which runs the entire depth of the building, 12 feet 10 inches wide, and 20 feet 6 inches wide at south-east angle for a length of 33 feet 10 inches. A passage which also runs the entire depth under the south corridor, on ground floor level. Between this passage and the area is a suite of offices appropriated to the following uses:””A kitchen, 29 feet by 29 feet 9 inches, with range, &c, scullery, lift, still-room, store-room, waiters’ pantry, servants’ hall, housekeeper’s room, pantry, and three larders. These rooms are 9 feet 6 inches high. To the left of area are four vaulted cellars for coal, four water closets, and dust pit. To the right of passage, and under south-west corner of large concert hall, are provided the following:””Beer cellar, wine cellar, soda water store, and china closet. A passage, 7 feet 6 inches wide, from rear wall of main building, runs for a length of 70 feet, communicating with a kitchen 40 feet by 22 feet 6 inches, under exhibition end of grand central hall, which is provided with an American stove, and has a staircase and lift to a large refreshment and tea room on ground floor. The ground floor, which is 2 feet 6 inches over the level of the ground, comprises the following:””A piazza, which forms the principal entrance, and is approached on the front side by two flights of steps, through three arched openings with quadrant angles, the two side openings having massive piers with coupled columns, in the Roman Doric style, standing out prominently in front, the centre entrance having piers of smaller dimensions, with single columns. The side entrances are also through arched openings with quadrant angles, having on either side a colonnade supported on iron columns, to correspond with those in exhibition building, and a glazed roof with ornamental lamps suspended from the centre colonnade, to the right being 225 feet, and to the left 105 feet long respectively. From the piazza the entrance hall is approached by three door entrances, 8 feet wide; it is 40 feet by 28 feet, having in continuation the grand central hall, which is 130 feet long and 40 feet wide, the whole of which is paved with encaustic tiles. This hall extends through the height of both the floors ; it is lit from the top only, and divided on this level by two rows of Caen stone columns with moulded bases and richly carved caps, having anti-pilasters at either side of wall to correspond. Six of these columns are square on plan, and have sunk and moulded panels on each side. 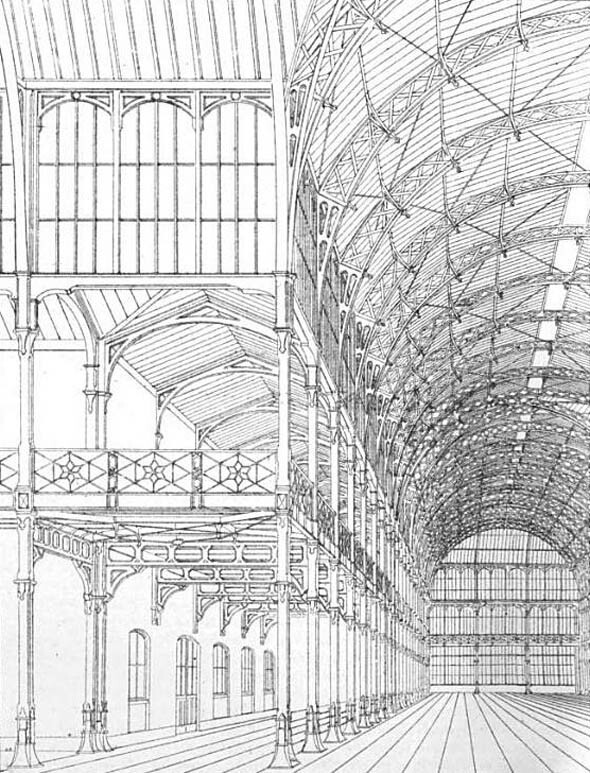 The height to ceiling under gallery floor is 18 feet, having an enriched cornice and entablature 3 feet deep, projecting 17 inches from face of wall, and returning along either row of columns which divide the hall into centre aisle, forming the principal communication into iron building, and two side courts intended for the reception of sculpture. The walls have been decorated with dark colours, Pompeian red being the prevalent tone, and this deepening the gloom of the shadow thrown by the galleries serves to throw up the sculpture. The court on the left hand has three doorways entering into large concert-hall and a niche facing the grand staircase. This staircase, the centre of which stands at a distance of 34 feet from entrance hall, occupies a space 39 feet by 14 feet, and forms the principal access to upper central hall, comprising a central flight of ten steps, ten feet wide, with bold curtail steps at bottom. Facing the centre of this flight, and on the first landing there is a niche to correspond with one at opposite side of hall. From this landing start two side flights, having 16 steps each, 7 feet wide ; and from second landing the gallery floor level is reached by eight steps ; the balusters for this staircase are of ornamental cast iron, to receive a deep moulded handrail of oak let into eight massive newels of wood, standing 5 feet high, and richly carved and moulded; the steps are of Portland stone, and the whole carried on ornamental cast-iron girders. Underneath this staircase (the soffit of which is plastered) are two doorways leading into small concert hall, approached by arched openings through 14-inch wall which carries the landing over; these two walls are terminated by square columns, similar to those before described. There are also doors leading into strong room, and north-east corridor, which is approached by an arched opening from entrance hall, and is 14 feet wide, terminated at a length of 78 feet by a similar opening, which leads into an inner lobby, and is 14 feet wide by 21 feet 9 inches long, communicating in continuation of corridor with winter garden building through an arched opening filled in with sash doors. At the west side of this lobby are two arched openings, through one of which is approached a wide and easy staircase, which leads to gallery floor level. At the east side of this lobby a hall, 16 feet square, is entered, having a small side door leading into winter garden building, and an entrance door 7 feet wide leading out to colonnade. Between this and corridor there is a gentlemen’s and ladies’ cloak room, each 31 feet long by 14 feet wide, and 18 feet high, each room having a fire-place, two windows with segmental arched heads, 10 feet high and 5 feet wide, and two doors opening into corridor and hall. This hall, which stands in a central position, is 14 feet square, having an entrance from colonnade 14 feet 6 inches high, and 7 feet wide, segmental arched head door, double hung, and fan-light over. The opening into corridor is through an archway 12 feet wide, with quadrant stopped angles. The ladies’ cloak room has in connexion with it two water closets. The north corridor, which runs at right angles to the east one, is 10 feet wide and 130 feet long, terminating with sash doors which open out into exhibition building. The small concert hall, which is 90 feet long, 50 feet wide, and 56 feet high, in addition to the two entrances before mentioned, has three doorways opening from north corridor, two from east corridor, and one from a lobby which communicates with exhibition end of central Hall. The number of seats provided on this level will accommodate 1,200 persons. The orchestra, which occupies the west end of the room, and has a depth of 24 feet, is 5 feet high at back, with a strand fall of 9 inches to the front, and is constructed to admit of private theatricals, with ample store room underneath. The front, which is of an ornamental character, has a moulded cornice, pilasters with moulded bases, and carved caps, between which are moulded panels; the platform for the singers is constructed in separate pieces, to admit of easy removal; a temporary enclosure, with box for the leader, is also provided for the band. The gallery, which is constructed on framed trusses, carried by 10 ornamental cast-iron columns, has accommodation for 240 seats. It is proposed to erect a second gallery for this concert hall, constructed on castiron girders, which will be carried on cast-iron ornamental columns, in continuation of first tier, provision for which has been made in the castings. The approach to this gallery would be from a continuation of staircase at north-east angle, a portion of the roof over north corridor being cut away to supply head room and light. There are at each side of this hall five large semi-circular windows, and two at east end with moulded plaster ribs between, the ceiling being coved and panelled, provided with ventilators and sun-burners for gas light. On left hand side of corridor, commencing at exhibition end, the following suites of apartments are provided:””Ladies’ retiring room, 15 feet square, provided with requisite conveniences; retiring room for solo performers, 21 feet 9 inches by 17 feet; retiring room for male chorus, 21 feet 9 inches, by 27 feet, with lavatory and closet arrangements for gentlemen; retiring room for female chorus, with closets and a ventilating shaft, 21 feet 9 inches by 16 feet. From the left of entrance hall the south corridor is entered through an arched opening, and is 14 feet wide by 78 feet long, at the termination of which, through a similar arched opening, the end hall is entered, having an outer entrance on to colonnade, and a wide and easy staircase up to gallery floor level. Off this corridor are two cloak rooms, entrance hall, &c, similar to those described for north side of building. The west corridor, which corresponds with the east one before described, forms the principal communication to the large concert hall, having six doors, 5 feet 6 inches by 9 feet, opening into that room. To the left of this corridor are the following rooms :””One 80 feet by 25 feet; one 30 feet by 28 feet; one 30 feet by 29 feet, for solo performers, with retiring room off, with closets, &c.; a retiring room for ladies, with conveniences; a stairs leading to basement and gallery floor. Central in this corridor, through an arched entrance a hall is entered 30 feet by 15 feet 6 inches, with large entrance door and side lights, which forms the private entrance to the main building. 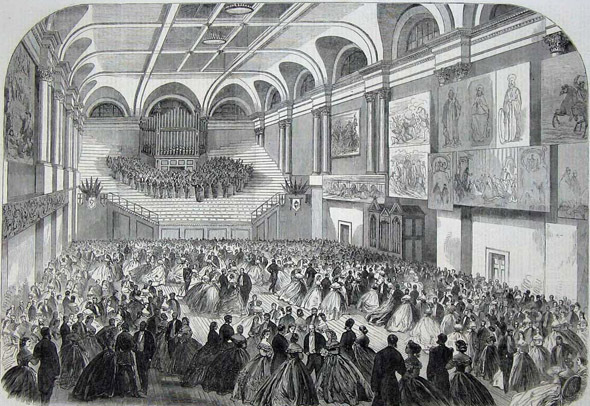 The large concert hall, which is 130 feet long, 65 feet wide, and 56 feet high, in addition to the doors from west corridor, has three doorways from grand central hall, a central entrance, 26 feet wide, into exhibition, and two side entrances, 7 feet wide, which are filled in with doors sliding into spaces left for that purpose in the walls. 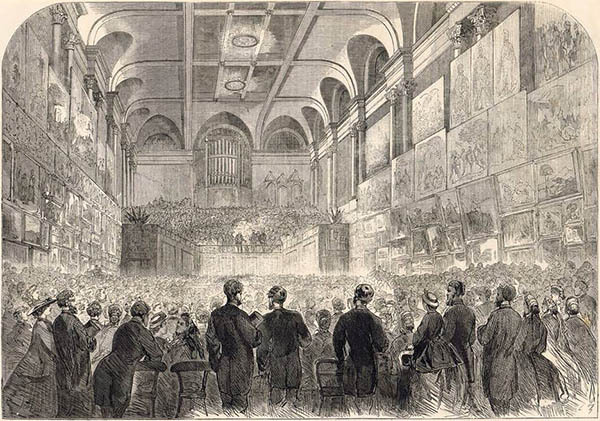 This room, which has accommodation for 2,400 persons, has a permanent orchestra at east end, 44 feet deep, and is capable of accommodating nearly 1,000 performers, having, in addition to the permanent seats, several rows of temporary platforms. There is also an organ and two staircases leading down to the bandrooms, which are underneath orchestra. The gallery, which has five rows of seats all round, has accommodation for 592 persons, and is supported on 19 cast-iron ornamental columns. The light for this hall is obtained through large semicircular windows, seven on each side, and three on each end. The ceiling is coved on all sides with moulded ribs between each window, returning across flat portion of ceiling, and forming it into compartments which are filled in with glass, having ventilating shafts in the centre, and sun-burners to light the hall by night. The upper central hall, forming a central communication from main building to the exhibition building through large folding doors, answers the purpose of a picture gallery, having a large amount of wall space for that purpose, and two doors entering into concert hall gallery. The wall on this level is enclosed with four angle pedestals and six intermediate ones, of wood, moulded and ornamented, which are intended to receive statuary, and filled in between with turned wood balusters, capped with richly moulded handrail. The framework of this well-hole, together with the gallery floor, is carried on wood and wrought-iron girders, supported by the Caen stone columns before described. At each entrance to the grand staircase stands a column of Caen stone, panel moulded bases, and carved caps, having a handrail between, with ornamental cast-iron balusters ; and at each end also stand two square columns of Caen stone “¢with anti-pilasters similar to columns in lower hall. The ceiling over this hall is coved, and divided into compartments by cast-iron arched ribs, the centre portion being glazed. From this hall the north -east corridor is entered through an arched opening, having off it:””Secretary’s office, 17 feet by 14 feet; clerk’s room, 14 feet by 13 feet 6 inches; lobby, 15 feet 6 inches by 14 feet; cloak room, 31 feet by 14 feet. At the end a lobby is entered, 22 feet by 14 feet, to keep communication with winter garden, through an arched opening filled in with glazed door. Off this lobby is an office, 22 feet by 16 feet, also two arched openings in connexion with staircase to ground floor. The north corridor, which runs up to exhibition building, from which it is enclosed by sash door, has an open timber roof, with skylight, and two rows of deck lights to supply light to lower corridor, two doors into concert hall gallery, and arched entrance leading into staircase. 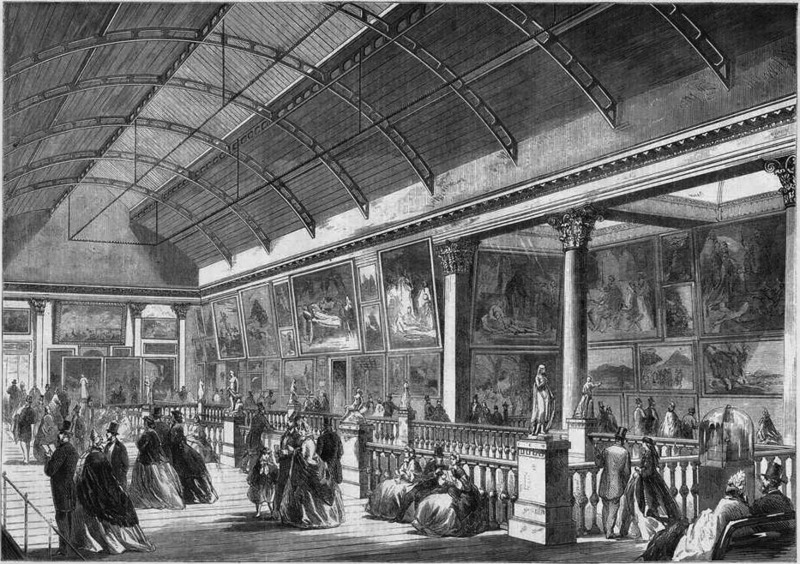 The picture gallery is 95 feet long and 22 feet wide, the ceiling of the room is covered, the panels of flat portion are filled in with glass, the light being obtained from a skylight which gives a dull light to show the pictures to advantage. There are also ventilators and gas jets to light the gallery by night. The lecture room, which stands at the back of small concert hall, is similar to the practice room underneath, the floors being secured by two trussed girders; there are two doors into this room, one from the corridor and one from central hall. The board room, which is over entrance hall and piazza, is 40 feet by 30; three windows facing Earlsfort-terrace, with coupled and single columns in the Corinthian order, standing out in front. 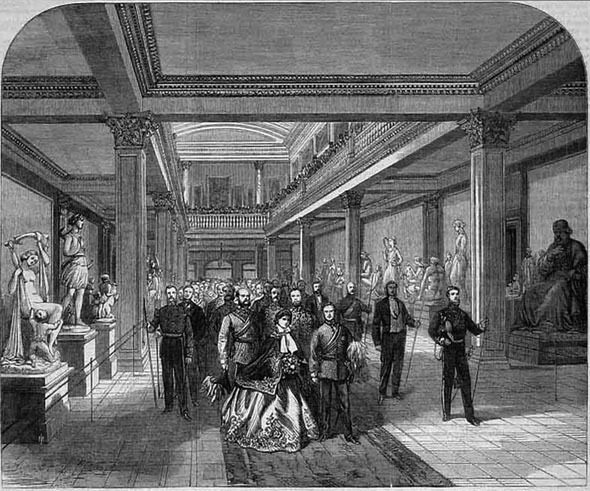 The south-east corridor, which also leads from the central hall to the centre lobby over hall, has two cloak rooms, 31 feet by 14 feet, for use of large concert hall, at the end of the corridor, the space which is occupied being staircase to ground floor, is entered through an arched opening. The south corridor, off which is the large dining-room, 170 feet long by 30 feet wide, which is divided by a partition the full width of the room, capable of being lowered into a double partition by means of crab winches; this room has six single, and one double window; four fire places, and three doorways into corridor, also serving room, lift, stairs, urinals, and three water closets in convenient positions. Over the present rooms, adjoining the north-east and south-east corridors, new rooms are intended to be constructed, which will comprise clerks’ offices and housekeeper’s apartments. The approach to these rooms will be constructed of cast iron perforated staircases, and will start from the present centre lobbies. The machinery annexe, which covers an area of 2,420 square yards, has a roof covering of part iron and wood, carried on wrought iron girders, supported by ten cast iron columns. This court, which is lit from skylights, is five feet under level of floor, of iron structure, and has an entrance into the Exhibition and Winter G-arden building; also a gate entrance into the stable-lane; and has fitted up within it an engine for pumping water throughout the building, and to a large tank on top of same, supplying fountains in the gardens. This engine also supplies hot and cold air as required throughout the various buildings by large flues, 4 feet 6 inches high, by 3 feet wide, which are constructed under ground, and run along the various corridors branching into the concert halls, and all the more important rooms of the building; as also through shafts into the galleries and rooms above. By this means the various halls can be charged with heated air, moistened to Summer temperature, and discharging into large shafts constructed from the ceilings of the concert halls, dining rooms, &c, through the roofs externally, worked by means of a fan. The whole of the iron structure is planned with bays 16 feet 10 inches from centre to centre, and covers a space of 7,300 square yards. The frame-work of this building comprises cast-iron foundation plates, provided with rain-water outlets, to which a portion of the first tier columns are bolted; transverse open work cast-iron girders, bolted or fixed to columns, pilasters and brickwork. Also longitudinal solid web cast-iron girders, connected to columns by dovetailed joints run with lead at the upper part of second tier columns, which are bolted to the first tier; transverse arched roof girders, and longitudinal cast-iron gutters are fixed. The third tier columns to clerestory are bolted to the second tier columns, having longitudinal cast-iron gutters fixed to the tops thereof; cast-iron buttresses are fixed to the third tier columns and to the transverse arched roof of girders. The abutments for the main roof over the nave are cast on the third tier columns. The nave roof principals are formed with angle iron flanges, connected by flat bar lattice work and cast iron bracket struts, to which are bolted the cast iron purlins, this forming an entire self-supporting frame work of iron 60 feet high, to be filled in and covered with wood work, glass, corrugated iron, and zinc. The winter garden portion of the building has a total length of 477 feet, and a breadth of 84 feet, divided into a nave of three bays, or 50 feet 6 inches; and aisles of a single bay each at the sides; the aisles are of two stories in height reaching to the springing of the nave ribs ; the floor of their galleries is 18 feet from the ground, and they are roofed over with a continuous span roof. 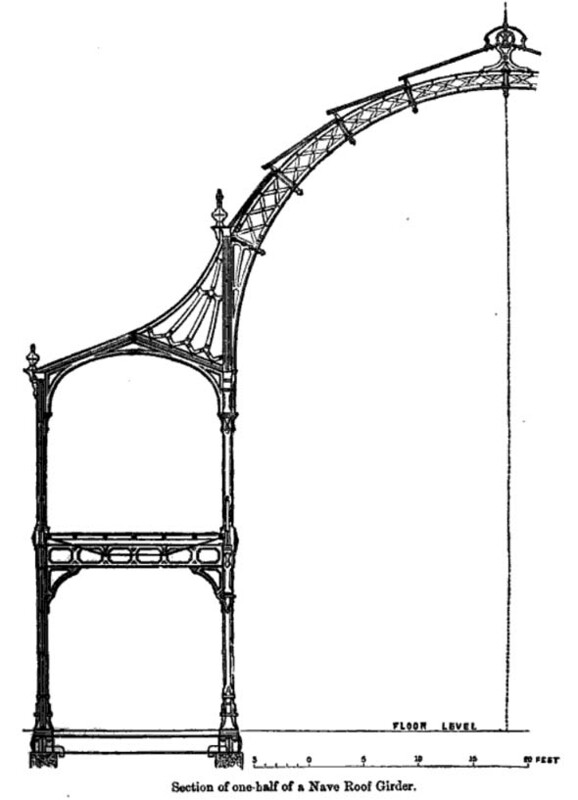 The columns are of cast-iron, and are square, with the angles rounded, have spreading bases and other features of an ornamental character ; and the points of connexion between them are the girders carrying the galleries, and all similar points of junction, are skilfully and suitably emphasized. The flying buttresses above the roof of side aisle distribute the thrust of the nave roof between the outer and inner line of columns; and as these are connected together at their bases by strong plate girders below the ground floor line, and are braced diagonally with horizontal diagonal braces at the level of the gallery floor, it has been found possible so to stiffen the whole aisle as to form a series of buttresses or piers to the nave roof, without recourse to diagonal braces fixed vertically, as is customary. The gallery flooring is also trussed by these wrought-iron rods, arranged diagonally on plan, by which arrangement the vertical pressure is at once brought on the columns and not transmitted to the girders, thus leaving them to their assigned duty of bracing the structure to resist the thrust of the roof. By this arrangement of the truss rods they also form a horizontal bracing to the galleries, and support the purlins on which the joists bear. The northern and southern transepts are enclosed and covered with glass, fixed in wood frames and bars. The courts are partially enclosed with corrugated iron, and the roof covered with Italian rolled zinc, and glass. In the centre of this building is a circular transept, with doors leading into the pleasure grounds, by means of a colonnade and steps, on to a broad terrace. To break the line of steps are granite blocks to receive vases. A large basin fountain and a canal in the centre opposite this transept have been constructed, but are floored over at present. At end of south transept are two staircases of wood, carried on cast iron girders, and leading up to galleries ; there is also a similarly constructed staircase at end of north transept, having a centre flight and two side ones to gallery floor leveL In addition to the circular projection before described, there are four rectangular projections, three bays of 50 feet wide and 6 feet deep The centre bay is filled in with doors opening on to landing, and steps which lead into pleasure grounds. 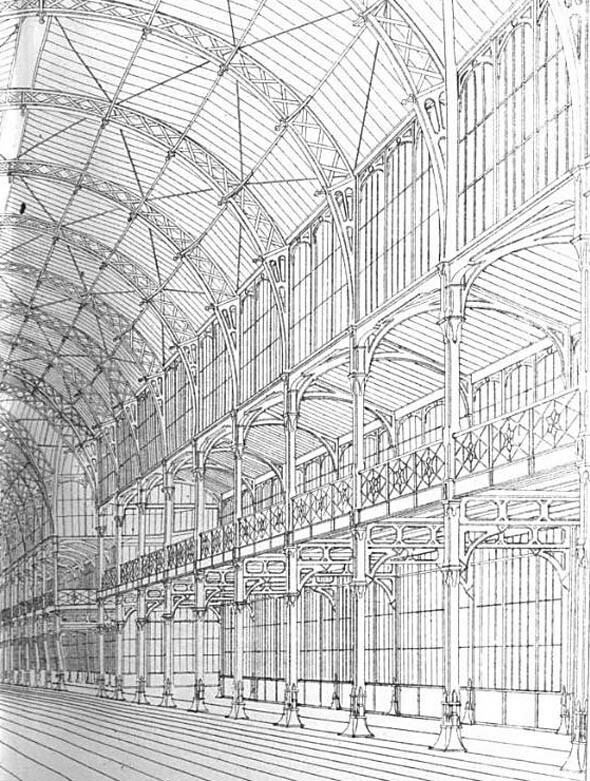 The Exhibition portion of the building is ten bays long, or 168 feet 4 inches, and seven bays wide, or 118 feet, and its galleries are two bays wide; it differs also from the Winter Garden portion in having its nave partly covered with an opaque roof of Italian zinc, and in having no central projection ; the two parts of the structure are intended to be separated by a glass screen, of light construction, with five pairs of doors opening into Exhibition on ground floor level, and two pairs on gallery floor level; it is also intended to continue the north gallery of the Exhibition across the nave in front of screen. At the east end of building are doors leading out on a colonnade. The gallery floor covers an area of 3,330 square yards, and has doors leading out to verandahs, over circular and rectangular projections before described.